UPDATE The Carousel opens to the public on Saturday, August 31, 2013 at 10 am. William Rogers discovered Haverhill after growing up in Connecticut, living/going to art school/developing his art career in New York City, and then moving to West Newbury. Business-wise he loves the fact that he can service his Boston and NYC clients easily from our neck of the woods, but his favorite things in this city are his neighbors in Rock Village. 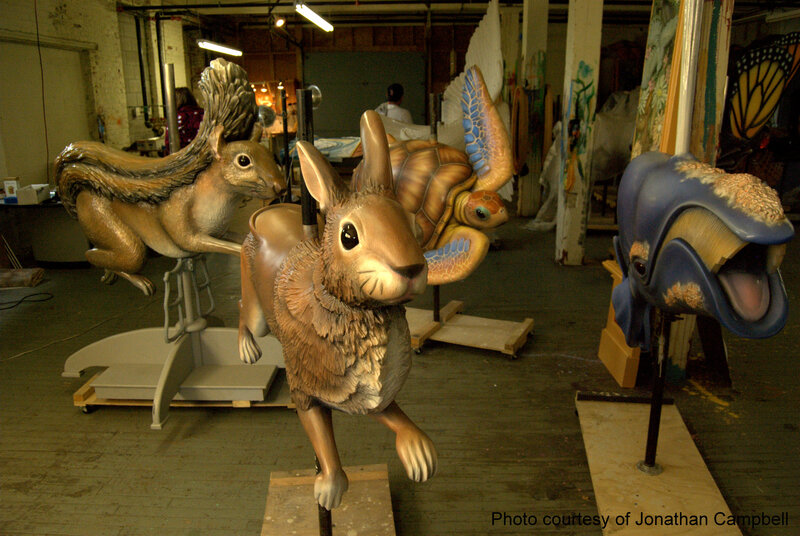 And they must be pretty terrific because I think some of my favorite things in this city are the carousel creatures he has housed in a temporary studio (they are too big for his regular studio) on Hale Street in Haverhill. He is not, as some have guessed, related to that other famous Haverhill artist Dale Rogers renowned for his giant dog sculptures. But I suspect, there is some ancestral art gene associated with the family name. Not all canvases are taut rectangles. Mr. Rogers’ canvases arrive from sculptor Jeff Briggs with realistic glass eyes but are otherwise void of any color but rich in their variety of details, dimensions, shapes, and textures. His project studio is a study of contrasts. It’s hidden away, has rundown industrial and railroad track views, with a few vibrant test splashes of color on white support columns. In a word, it’s ugly. But since the studio houses a menagerie of super-sized indigenous animals both fantastical and realistic that is stunningly beautiful, the studio details beyond the fluorescent lights and stacked Dunkin Donuts styrofoam take-out cups are quickly forgotten. 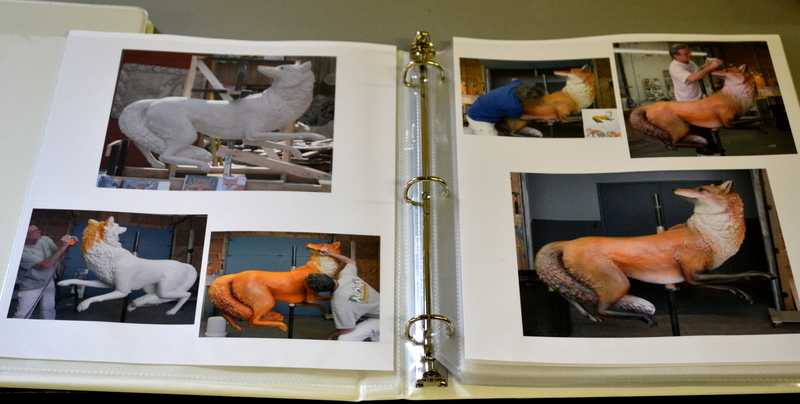 The white sculptures are accompanied by color swatches, artist renderings and photo studies of the creatures in the wild. 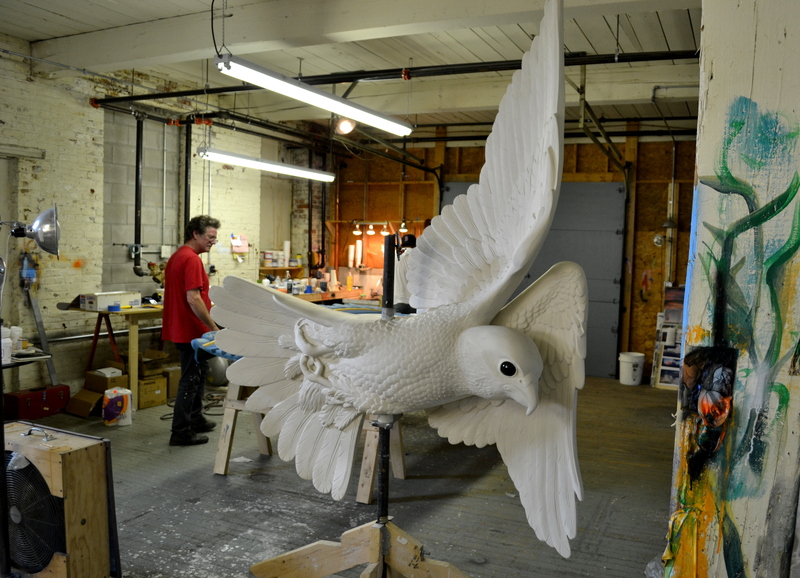 For over a year, Rogers has been collaborating to convert intricate white sculptures of creatures found in our back yard into life-like-but-better works of art. Case in point – his insects and rodents will entice even the most skittish fan. 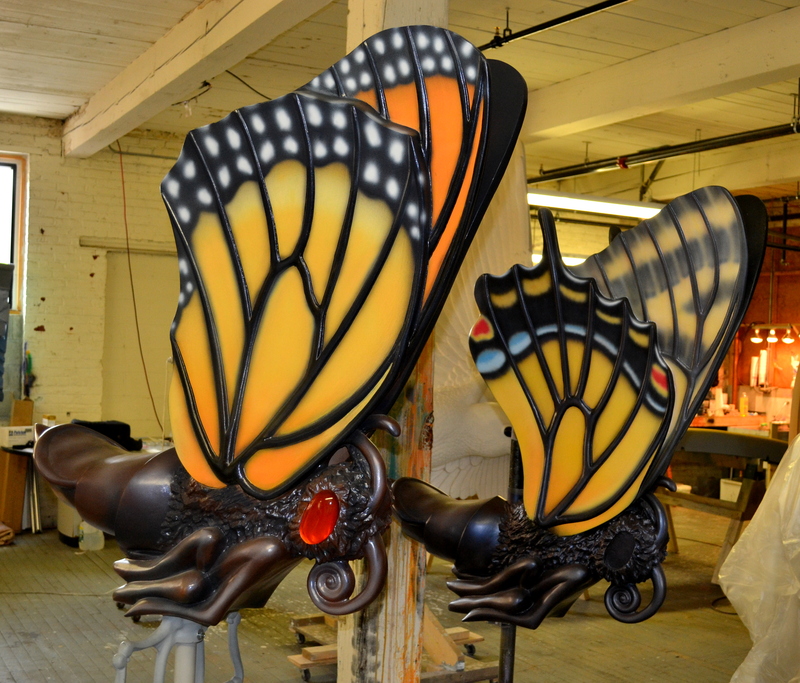 The carousel sculptures are first primed, then air-brushed, then details are hand painted, finally they are sealed. But there is no assembly line in the studio. 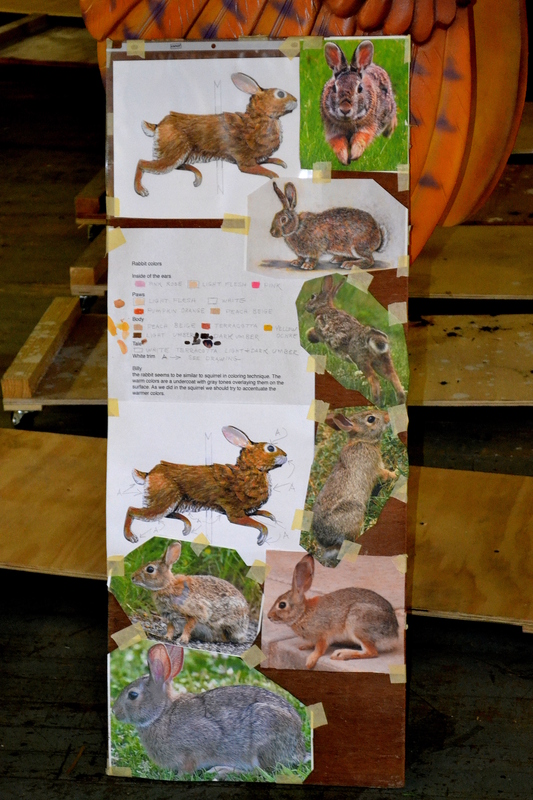 One rabbit is air brushed at a time, one fox sealed. Each finished piece is as unique as its living counterpart. 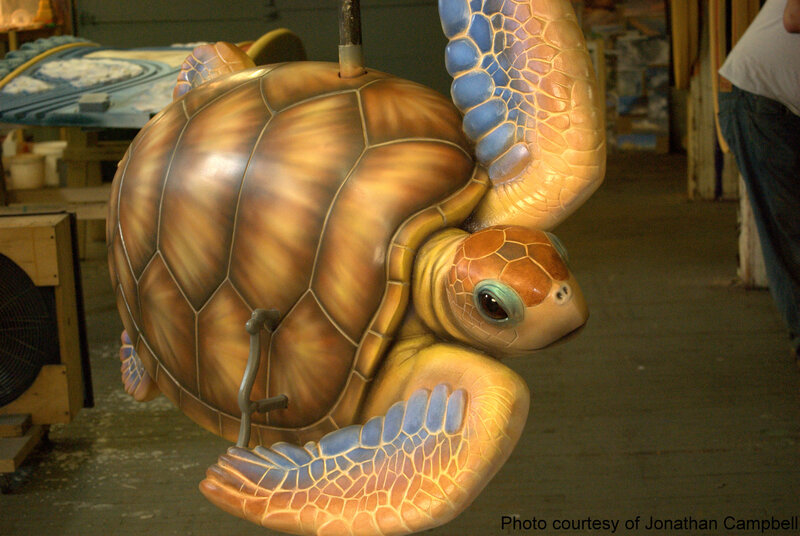 In a nod to marketing, there are slight embellishments to nature: the whale’s spout is sprinkled with sparkles, the turtle’s enhanced iridescent coloring makes it look different from different angles, and the owl, which might have been too monochromatic on top to attract young riders with its natural solid, white coloring, was embellished with intricate hand-painted markings that should make Mother Nature reconsider her original design. The fabulous colors are actually durable automobile finishes made to withstand thousands of kicking feet, wiggly bottoms, dripping ice creams and over-zealous riders. Each animal can hold 1000 pounds, so it won’t just be children angling for the perfect animal ride. Despite the protective coating, each will need annual care from Rogers. If left unattended for millennia, would these sculptures return to their original white confounding historians for ages like the marble Parthenon statues or is automobile paint that much more stable than the paint of artist Phidias’ day? 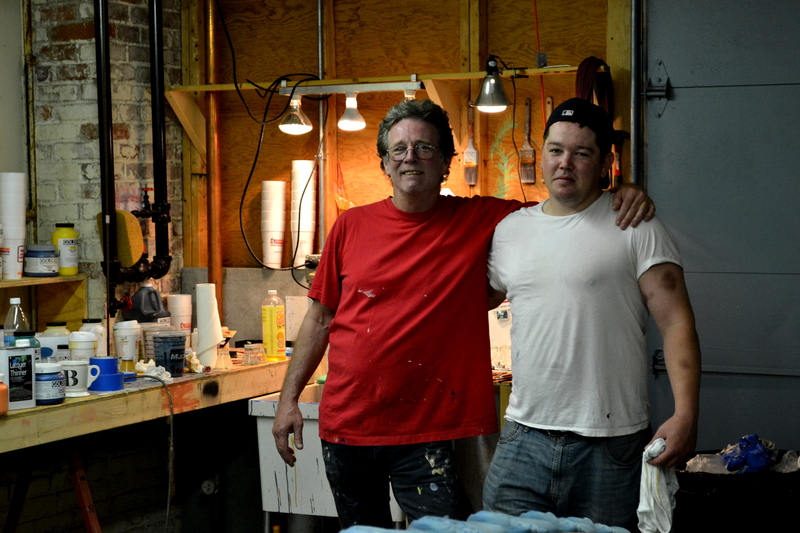 Mr. Rogers does not create the sculptures; the multi-talented artist Jeff Briggs of Briggs Design in Newburyport does (http://www.briggssculpture.com/frameset.html),. With this partnership we see that the good neighbor theme persists. Rogers was brought into this, his second carousel project, by Briggs who was a neighbor in West Newbury. William senior has not made a career out of carousels. Instead his career took direction many years ago when he painted a backdrop mural of a delicatessen for a photo shoot in NYC. From there he’s painted backdrops for model shots and advertisements that have graced the cover of many of the most highly regarded and recognized magazines including Time, Golf Digest, NY Times Magazine, TV Guide. Mr. Rogers is skilled in creating massive murals and trompe l’oeil artwork that makes the impossible seem real: A beach mural calms the anxious patient in a dentist office, a gated wall in a galley kitchen seems to open the small space up to the elements, mammoth cylindrical tanks are camouflaged by painted clouds and blue sky. One of Mr. Rogers’ signature subjects is clouds: before and during a storm, at sunset, scantily dotting a cerulean sky. 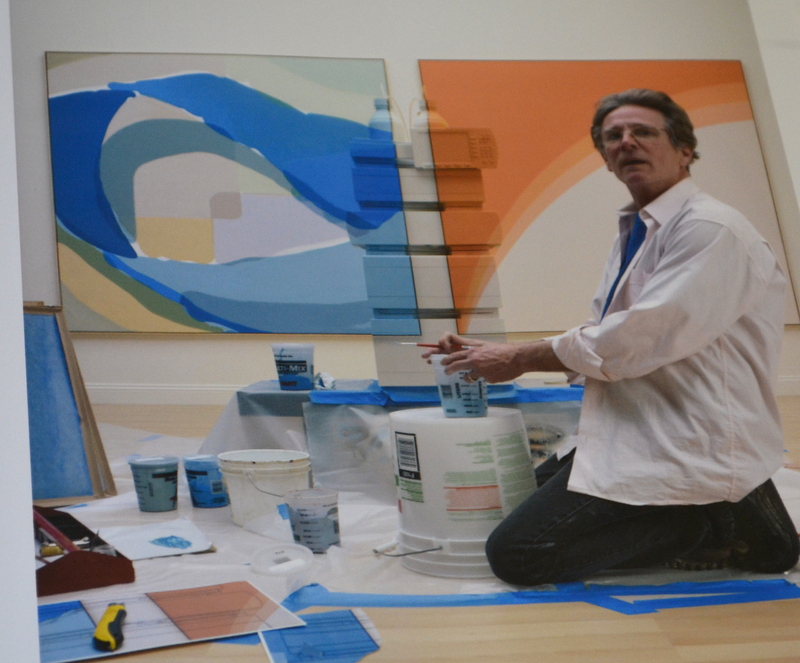 He paints his clouds from memory based on past observation, and occasionally some photo inspiration supplied by Mr. Briggs and others, but the end result is completely fabricated, and so despite their seeming realism, they are abstracts. Mr. Rogers’ website showcases a wide range of his talents including his fine art paintings. http://william-rogers.com/gallery.html and at http://fineartamerica.com/featured/snowstars-william-rogers.html. 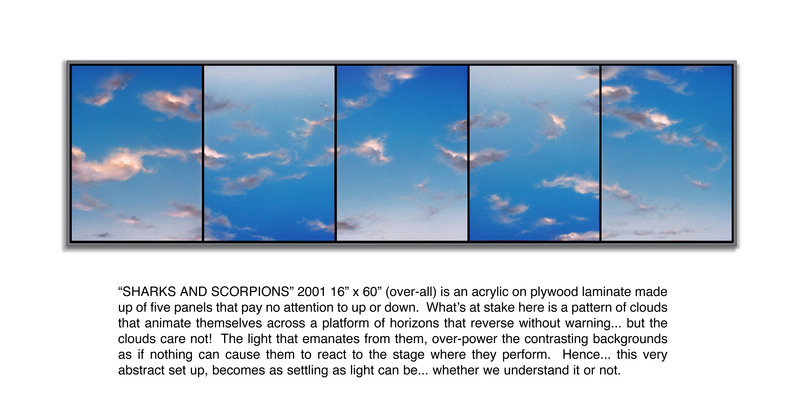 When displayed in your home his heavenly fine art clouds would act as a salve to the chaos of modern living. Check out his scenic painting backdrops, too. 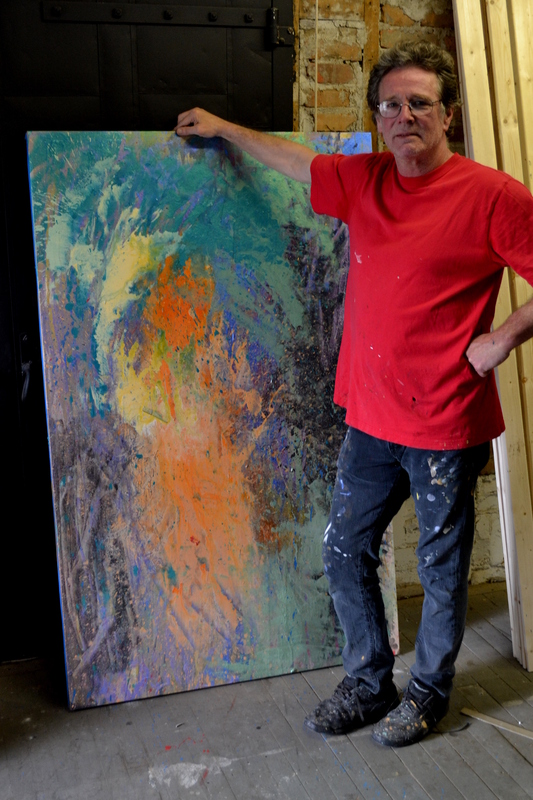 I found myself drawn to the hazy 10’ x 10’ (that’s feet, not inches) indoor competitive pool and another more modest living room–sized painting in the studio that he created from splatter and remnant paints from the carousel project. 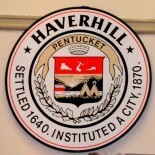 Surprisingly, Mr. Rogers whose work has been displayed all over the planet does not to his knowledge have one on display in Haverhill outside of his gallery; a fact that I am sure will change shortly after this blog appears in the inboxes of Haverhill residents. According to the Rose F. Kennedy Greenway website http://www.rosekennedygreenway.org/the-conservancy/planning/greenway-custom-carousel, the Greenway Carousel is 95% privately funded and is scheduled to open for Labor Day and keep running on selected dates through December. Despite my penchant for rabbits, I might have had difficulty picking which animal to ride. Fortunately, the Greenway Conservancy is considering selling season passes. I may start with rabbits and work my way through the mammals, and insects, fishes and crustaceans, birds and perhaps end with a skunk so realistic I may approach with extreme caution, but I guess it is safer to be atop the skunk than behind it! It’s incredibly beautiful and very loud! 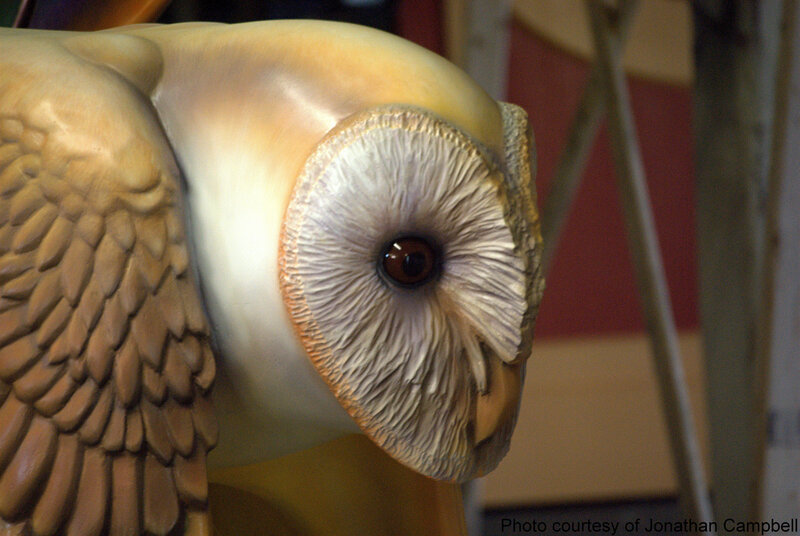 Special thanks to Jonathan W. Campbell for providing the photos of the 4 sculptures, the owl and the turtle. Great images all. What a fantastic story! I’d be there all day deciding on a favourite. Thank you Lisa-Maree for reading and commenting…thought I should mention here, that shortly after being featured in this blog, Mr. Rogers was honored as Haverhill’s Artist of the Month. Congratulations to Mr. Rogers. This entry was posted on May 28, 2013 by Brain4Rent/THoH in art, Bradford MA, Good news, Haverhill, Massachusetts, Uncategorized and tagged Alison Colby-Campbell, animal sculptures, Art, artist process, artists, Boston Carousel, BRADFORD ma, Brain4Rent, Briggs Design, cloud paintings, creativehaverhill.org, Greenway Carousel, Greenway Carousel Boston, Haverhill, Haverhill artists, Haverhill MA, Jeffrey Briggs, mural back drops, painting, photography, Rose F. Kennedy Greenway, Rose Kennedy greenway, sculpture, trompe l'oeil, William Rogers.